The success of Hayes Valley’s current commercial district was boosted in part by the destruction caused by the 1989 earthquake to the Central Freeway, which had entrance ramps on Franklin and Gough streets. The freeway was an eyesore and created noise pollution that kept businesses and foot traffic away. Not long after that part of the freeway came down, the community began to transform, and commerce moved in. Unlike some other parts of San Francisco, Hayes Valley has managed to retain a sense of community and a nonexclusive feel despite the fast build-up and high price tags. Some of the businesses that braved the less-than-savory days are still around, such as the Hayes Street Grill, now twice its original size. But many of the shops sprouted up in the ’90s, making Hayes Valley a real destination spot. Hayes Valley is one of San Francisco’s most eclectic neighborhoods with some of the city’s best boutique shopping, fine dining, cultural venues. It’s close to tech shuttles and public transit and brimming with world-class culture. The Hayes Valley real estate market is dominated by condominiums and luxury apartment complexes. With the addition of new units and the neighborhood’s popularity continuously growing, the market is trending up. Octavia Boulevard & Hayes Green: Octavia Boulevard, which replaced the demolished Central Freeway, leads to a community park at the center of the neighborhood, the Hayes Green. It’s flanked by hip eateries and housing. Chances are you’ve seen the gorgeous layered Russian honey cake with salted honey buttercream on Instagram, perched atop gorgeous vintage plateware. 20th Century Cafe also sells lots of other Eastern European treats like housemade bagels with smoked salmon, pierogis, knish, and linzertorte, all in a pretty setting. Instantly-trendy a Mano is the spot for affordably priced but carefully prepared pasta and pizza. Located in a new condo building with refined modern touches to match, the inviting atmosphere at this latest venture from restaurateur Adriano Paganini has led to brisk business. And with no reservations, diners might do best to put their names in and stroll down Hayes Street or enjoy a glass of Italian wine at the bar. Chef Freedom Rains has prepared a menu of crowd-pleasing dishes like bucatini all’Amatriciana and agnolotti dal plin — small, buttery ravioli filled with roast pork, chicken, and chard — and service, which is on point, seals the deal. Long before Hayes Valley was the new “it” SF neighborhood for dining, this Parisian-inspired bar and restaurant was a popular destination for oysters, fancy drinks, and pre-theater dinners. But despite being one of the oldest kids on the block, Absinthe is still always bustling thanks to well-executed French- and Mediterranean-inspired dishes and perfectly crafted cocktails. The kitchen is open until midnight on the weekends, which makes it a great choice for a late-night bite. Brass Tacks took over the space next door, did it up with bright colors and floral touches, and turned it into the hottest drinking patio in the area. Anina’s cocktails are top notch, though they cost a pretty penny, and punch bowls like the Young Cuban (white rum, mint, cucumber, lime, prosecco) are the stars of the party. Those who don’t have them — or, for that matter, a seat at one of the bustling picnic tables from which to enjoy them, will hover jealously. For food, there’s a rotating pop-up window, and for cooler afternoons and evenings, there are string lights and heat lamps. When the sun is shining, Arlequin Café’s garden is a perfect place to enjoy a reasonably priced sandwich or salad and a glass of wine. 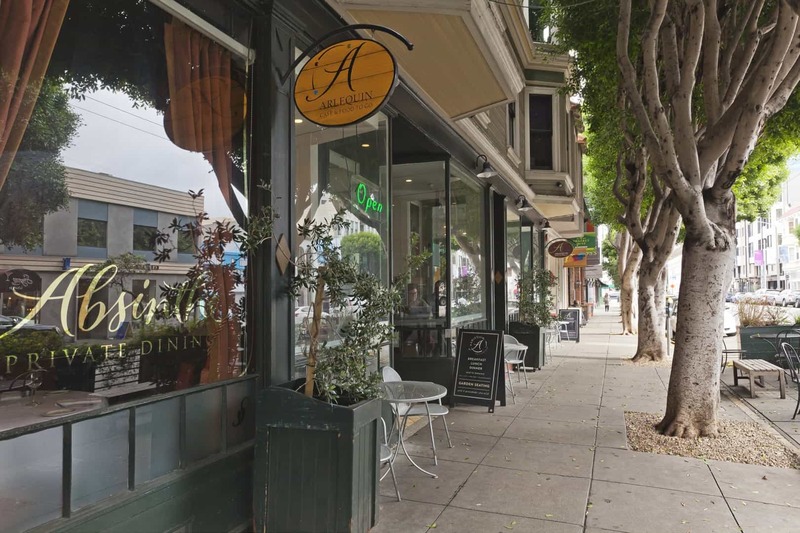 The café is counter service, so if you’re planning on enjoying more than one glass of wine (which you should be), just grab a bottle from Arlequin Wine Merchant. That way you won’t have to disturb your tranquility by waiting in line more than once. Tapas, gin tonic, and more tapas are the many reasons to dine at Barcino, an homage to Catalonian cuisine from the Absinthe Group. A recent substitution for their previous restaurant in the same space, Barcino is a refinement on the group’s winning Spanish formula, tested last year with the Design District hit Bellota. Barcino’s cocktail menu (created, like Bellota’s, by Collin Nicholas) is a delight, sherry options are extensive, and small plates devised by Absinthe Group executive chef Ryan McIlwraith, such as a photogenic sunny side up egg with caviar, ham, and delicately fried potatoes, are as tasty as as they are pretty. Don’t skip dessert from pastry chef Michael Aguilar, who knows how to make a mean churro s’more. If there’s one thing San Franciscans love (despite the fact that the average temperature is 57 degrees), it’s drinking outside. The only thing that makes it better to them? Waiting in line to do so. Biergarten, a charming Bavarian-style beer garden from the people behind Suppenkuche, delivers on all fronts. There’s usually a line for the rotating selection of Bavarian beers, but you can order by them by the liter, which helps ease the pain of the wait. There’s also a pretty robust food menu with options like bratwursts, sliders, and sandwiches on pretzel knots, which you’ll definitely need if you plan on indulging in more than one liter.